Can pull up more than ten centimeters of phoenix tail, hair that can move with the wind... These are the paintings that the 80-year-old artist Xiao Yu sculpted on the skin less than 1cm thick. How does a cowhide go from plane to solid, and how does Xiao Yu integrate traditional carving techniques with new materials? The reporter recently went to Xiao Yuâ€™s studio and interviewed the man who created the new carving type of carving. I would like to use the sculptural painting to show the dreamland into Xiao Yu's studio. The scent of the skin rushes forward. Large and small cow hides fill the entire work room. There are dozens of cutting knives placed on the worktable. Xiao Yu was born into a sculpting family. His grandfather was engaged in carving. He also engaged in traditional wood carvings, stone carvings, and mud sculptures. After constant trials, one day, he carved two knives on a piece of kraft scrap and found it. The material can also be used for engraving. A small attempt inspired Xiao Yuâ€™s creativity. "Cow leather is soft, close to the human body's color, through different carving techniques, you can show a three-dimensional feeling on the top." Xiao Yu said. Now Xiao Yu uses the first layer of leather imported from Europe to create leather carvings. Each thickness is between 0.3 cm and 0.4 cm. The thinnest place is only 0.01 cm. The cow hide is placed in the sun and can project the shadow of the work. â€œIn the future, natural materials such as light, plants, and water will be integrated into the sculptural paintings to create a dream-like decorative painting with pure natural elements.â€ He said that he wanted to embody the dream in the real world through the carving of the skin. come out. Incorporating various traditional painting techniques Xiao Yu is particularly obsessed with Chinese traditional craftsmanship and culture. 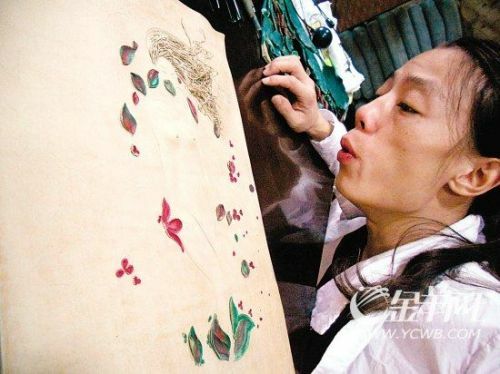 The shadow paintings in Sichuan, ancient Mongolian sheepskin paintings, clay sculpture techniques and other techniques are the source of his creation. He once went to Sichuan to watch the shadow play for a period of time. When traveling in Inner Mongolia, he paid special attention to their sheepskin paintings. â€œThe same is done on the skin, and after the emptiness, adding music, movements and other elements, the shadow play has become a smart figure.â€ Xiao Yu said that at the beginning of his creation, the shadow painting gave him a lot of inspiration. During his trip to Inner Mongolia, he noticed that ancient Mongolians used sheepskins for paintings, especially early sheepskin maps, and later moved the portrait of Genghis Khan to sheepskin. As a result, he continued to think about using the soft and elastic qualities of leather to express a dynamic image. Xiao Yu introduced that the parts of the carving can be carved into very small things that can be danced by the wind. For example, his carved phoenix tail can also move with the wind. He also joined clay sculpture techniques to reshape parts. For example, in the work â€œDrunk Peonyâ€, the petals of the peony are flat when they are sculpted. After being kneaded, the peony has a natural concave-convex texture and is highly stretchable. Of course, there is also a characteristic of leather carving, that is, the color of leather is particularly close to the human body, and his favorite work â€œOpening Springâ€ shows the image of a young girl. The girl's skin feels soft, like the human skin. Xiao Yu said with a smile, "You feel it like a real skin, very vivid. It looks like the same girl is sitting sideways in the flowers." Our snow boots are main used in textile materials for upper,lining and insole,even sole for some styles. All snow boots are mainly for comfort and warmth in home.Also some styles can be worn in outdoor.